Abena Agyeman-Fisher is the Editor-in-Chief of Face2Face Africa. Most recently, she worked for Interactive One as the Senior Editor of NewsOne, she worked for AOL as the News Programming Manager of Black Voices, which later became HuffPo Black Voices, and for the New York Times Company as an Associate Health Editor. Abena, a Spelman College graduate, has been published in Al Jazeera, the Daily Beast, New Jersey’s The Star-Ledger, the Grio, BlackVoices, West Orange Patch, About.com, the Source, Vibe, Vibe Vixen, Jane, and Upscale Magazines. She has interviewed top celebrities, icons, and politicians, such as First Lady Michelle Obama, Senior Advisor to the President Valerie Jarrett, Civil Rights activist and diplomat Andrew Young, comedian Bill Cosby, Grammy Award-winning singer Jill Scott, actress and singer Queen Latifah, Olympic Gold winner Cullen Jones, international supermodel Alek Wek, and five-division world champion boxer Floyd Mayweather. Most recently, she served as the First Lady’s press reporter during President Barack Obama’s U.S.-Africa Summit, Young African Leaders Institute event, and the 2013 presidential trip to Senegal, Johannesburg, Cape Town, and Tanzania. Abena is also a 2015 International Women's Media Foundation Africa Great Lakes Fellow, where she reported on women candidates and Chinese sweatshops in Tanzania for CNN and Refinery29. 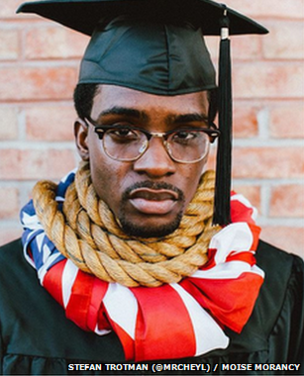 Moise Morancy (pictured), an artist, musician, and actor living in New York, has set both Instagram and Twitter aflame with his bold self-portraits that display both an American flag and a noose wrapped around his neck. In each portrait, Morancy takes on a different personality (a graduate, convict, gang member, and professional) to make the point that no matter one’s social ranking or profession in the United States, racism against Blacks doesn’t discriminate. 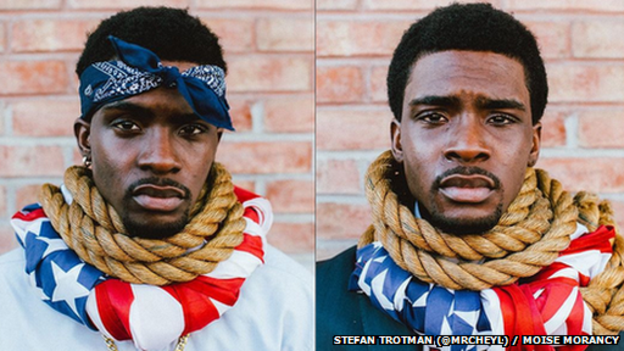 His explosive portraits spurred the hashtag #ItDoesntMatter and has been used more than 20,000 times this week. On why he decided to take the photos, Morancy says that recently seeing a Black Father advise his son on maintaining a strict dress code was the catalyst. “I’ve given many speeches to youth groups and sometimes misguided young people tell me that the way you dress will give you validation and respect in society. I disagree. “Martin Luther King was killed in a suit. Travyon Martin was killed in street clothes and a hoodie,” says Morancy. Morancy adds that the “hanging” of African Americans by a racist society isn’t just physical, though. “I’m not saying I think the president would be treated the same as a gang member,” he says. “And I’m not saying everyone is going to get a noose around their necks. They don’t hang people any more — most of the time.